This massive reworking of the software offers improved usability, adjustability and sonic authenticity. Responsive to picking and instrument controls. Ability to mess around with amp components. Good value. Peavey's ReValver 4 is a major update to its standalone and plug-in amp modelling software, that allows you to tweak the amps at component level. The company says that it is a complete redesign from the ground up, so that all aspects of the program are new, from the engine of the program to its graphical user interface. Also new is the pricing structure, which sees a basic version of the program downloadable for free, with additional modules (amps, stompboxes, etc) available for purchase online from $1.99 to $7.99. If you don't fancy doing it that way, there's a ReValver 4 Producer Pack ($99.99) that comes loaded with all the equivalent amp/stomp/effects/RIR cab modules from version III.V, plus some new stuff. Owners of III.V can upgrade to the Producer Pack for half that amount. ReValver 4's GUI is more user-friendly than the previous version. Now, rather than one single scrolling rack view, you can call up separate views for the input and output sections, the amps and cabs and the post-effects rack, plus you get a nice virtual pedalboard to drag stompboxes onto. "ReValver's sounds are very responsive to picking dynamics and guitar volume control"
ReValver 4 offers a dual signal chain, so you can run two rigs together with various output options and, with plenty of Peavey amps, plus the popular choices from other manufacturers, there are a lot of great-sounding tonal options available even before you start tweaking. 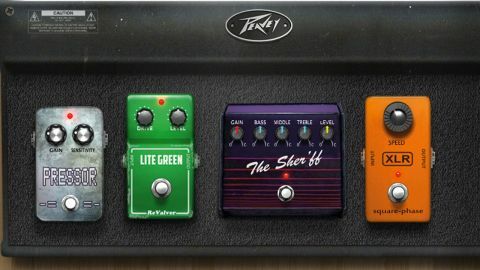 ReValver's unique feature right from the start has been the fact that you can look at schematics and mess around with any amp's components - change valves, swap transformers, et cetera - and now Peavey has refined that with new technology, opening the route to custom designing your own amps. The speaker side of things has also improved with the RIR 2 Speaker Simulation module, which offers convolution-based cabinet modelling with adjustable mic placement and attention to details such as adjustment of the interraction between guitar and cab. Two entirely new features are worthy additions to the program. The first is yet another sound-tweaking option in the form of ACT (Audio Cloning Technology). This module offers shaping of the guitar sound at the input to make your guitar sound like a different guitar/pickup combination chosen from a set of profiles - Les Paul, Strat, for example. You can also use ACT after modelling for some final tone shaping. The second new feature is a GIG mode, whereby you can load eight presets into the memory for instant access. You can switch between these using your mouse, but they can also respond to MIDI control, so you could use a MIDI switcher, making live use a more practical proposition. ReValver's sounds are very responsive to picking dynamics and guitar volume control, making for a satisfying playing experience. With a pair of amps, some cabinets, overdrive, tremolo and reverb, the free version has plenty to get you started and let you know whether ReValver is for you. If it is, we reckon that the Producer Pack is a real bargain.